Book Closeouts, online at BookCloseouts.com, is one of the best sellers of bargain books. They offer books in a wide array of categories, such as architecture, biography & autobiography, children's books, business & economics, house & home, health & fitness, fiction, foreign language, humor, law, music, medical, religion, sports, travel, and the list goes on, starting at prices of less than $1. Be sure to check out RetailSteal.com for all the best BookCloseouts coupons, BookCloseouts deals, and BookCloseouts codes. Book Closeouts charges a handling fee of $1.00 and shipping rates are calculated based on size and country destination of your order. See website for more information and details. 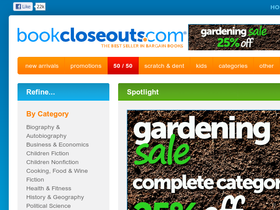 Shop online at BookCloseouts.com and enjoy a $20 discount on your order with this coupon code. Use password "bookcloseouts" on your purchase of $120+ to qualify. Use this exclusive RetailSteal code at BookCloseOuts.com and get $10 off your order of $65 or more. Click link now and use. If password is necessary, use "bookcloseouts". Right now at BookCloseOuts.com, spend $35 or more and get free shipping on your order. Click link and use coupon code. Act now and take advantage of a $5 discount on your order of $35 or more from BookCloseouts.com. Use promo code at checkout to save with password "bookcloseouts". Check out BookCloseOuts.com to get 50-90% off all books. Click link now to save. At Book Closeouts, save up to 85% on scratch and dent books when you shop online. Click to save. Check out the Children's Sale at BookCloseOuts.com to find thousands of titles for only 99 cents. Click link now to browse the selection. Buy softcover books for $1.99 and hardcovers for $2.99 during the summer fiction sale at Book Closeouts. Click link for savings. Save $10 on orders of $65 or more from Book Closeouts when you use this coupon code. Click to save. Shop the sale at Book Closeouts today to find 50% savings on all Dummies books.